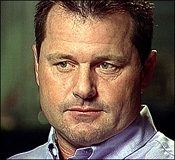 JANUARY 7--Tarred as a steroid-using cheater in the Mitchell Report, Roger Clemens last night filed a defamation lawsuit against his former trainer, who has told investigators that he frequently injected the baseball star with an assortment of performance-enhancing drugs. In his lawsuit, Clemens accuses Brian McNamee of lying about his alleged steroid use and contends that the false allegations 'injured [his] reputation and exposed him to public hatred, contempt, ridicule, and financial injury.' A copy of Clemens's lawsuit, which was filed in Harris County District Court in Texas, can be found here. The complaint was filed after Clemens appeared last night on CBS's '60 Minutes' to rebut McNamee's claims, which first surfaced in the steroids-in-baseball report prepared by former Senator George Mitchell. Clemens contends that McNamee made his claims 'with actual malice, knowing they were false,' and fabricated the claims to transform himself from a 'target' of federal prosecutors to one of their witnesses. The lawsuit contains what appears to be recent quotations from McNamee, who describes his interaction with federal agents.